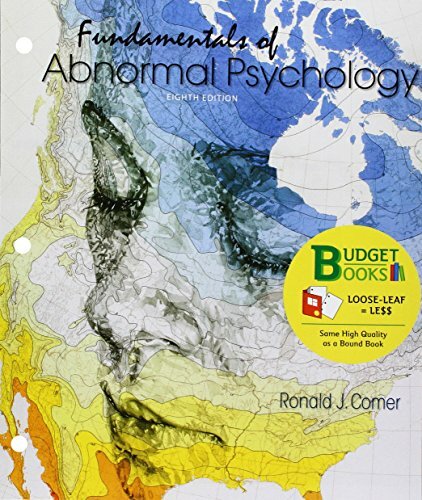 Fundamentals of Abnormal Psychology helps students understand what it is really like to live with, study, and treat psychological disorders. Combining the latest research with the actual experiences of clients, their families, and practicing therapists, Ron Comer opens the doors of this inherently fascinating field in an eye-opening, science-based, and yet human way. Comer not only encourages students to think critically about the science and study of mental disorders—he also reveals the humanity behind them. The new edition of Fundamentals of Abnormal Psychology incorporates new directions in theory, diagnosis, and therapy, with much new material on cultural aspects of psychological dysfunction, on “new wave” cognitive and cognitive-behavioral approaches, and on the latest relevant findings from the field of neuroscience. Available with the new edition is the latest in media-powered teaching and learning support, including the new Abnormal Psychology Video Tool Kit (available to package with the text).